< Ebbey the canine actor poses in an Autumn Meadow. The ridgeback cross plays a search dog in the new film SEARCH DOG'S RAVEN: the Eerie Story of a Wilderness Search Dog Team. Ridgebacks are great dogs, as long as you know what you're up against. Allex Michael: As a lifelong dog lover, I am ashamed to admit there were several times times when I hoped Ebbey would just run away. Ebbey the canine actor is my first ridgeback cross and was found starving in a garbage dump as an adult. Because of this, it was hard to know if all her quirks are from being dumped and abused, being a cross OR characteristic of the Rhodesian Ridgeback breed. There is also an email from Psyche Rankin a Rhodesian ridgeback breeder who feels this information discredits the breed. 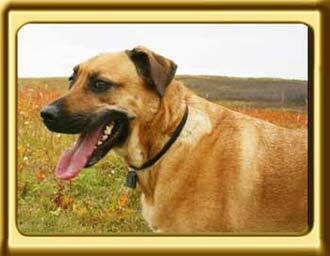 Ebbey Trivia with Photos has some revealing behaviors, some of which are very characteristic of ridgebacks.